→What To Put In A Baby Crib And What Doesn’t Go With The Crib? What To Put In A Baby Crib And What Doesn’t Go With The Crib? While organizing the crib for your baby, you will have to consider his comfort as well as safety. You should add some things in the baby crib for his support along with discarding certain things to ensure his safety. Some of these things are briefly described here for your guidance. The bed is the safest place for a baby to sleep on or play on. It keeps them away from the dangers of being suffocated by the body of the parents lying beside them or being rolled out of the crib. They may sleep for a longer time in their own space on their bed in the crib. Check out Top 10 Baby Crib Bedding Sets on Mybestcribs.com that parents can choose to make a perfect baby nursery. Instead of using soft mattresses in the baby crib you must use firm mattresses as it reduces the chances of sudden death of the baby. The additional materials used in the mattresses to make them softer can increase the chances of suffocating the baby. A firm, non-toxic, organic crib mattress allows him to breathe easily as well as move without any effort while sleeping. Crib sheet is something to cover the mattress. Sheets made of cotton fabric can be the best choice to provide a comfortable surface to your baby to take rest in the crib. It will protect the mattress from getting wet when the baby urinates while sleeping or spills of milk or other liquid in the crib. It will keep the mattress odor free and dry. Soft baby sleepwear that can keep your baby comfortable and warm is also necessary to be put in the crib to allow him to have a restful sleep in a friendly environment. The crib of your baby should not include any additional item like a stuffed animal or pillow etc. People usually put pillow and stuffed toys in the crib to provide extra comfort to their baby, especially during cold weather. You can set an additional layer of take-over sheet instead of a pillow or stuffed animals if you fear that the baby may get cold. The use of additional items can increase the risk of SIDS. Many people put bumpers in the crib when their baby starts rolling in it. When the baby rolls over in the crib, then his head strikes on the side of the crib. To protect his head from getting hurt parents usually put the soft bumper in the crib. Though it seems to be a good idea, sometimes it can be dangerous for the baby. He can get suffocated when his face will strike on the bumper while rolling over to his side. If you want to protect your baby from getting stuck in the bars of the crib then instead of bumper you can use mesh lining inside the crib as it is breathable and safe for your baby. Sometimes people hang certain things above the crib to keep their baby happy and entertained. But it is a wrong practice. Though it is admissible with small toys, sometimes they hang heavier items like mobile phone or chandelier, etc. These heavy objects can be dangerous for the baby when they fell on them due to any reason. If you want to entertain your baby, then you can show something on the ceiling through a projector. Sometimes parents leave few things around the crib so that their baby can grab them while rolling over on his side. But such things can be dangerous for the baby as he cannot manage the items on his own. Suppose, you are sleeping or away from your baby, and your baby can get stuck with the things around him. In this situation, he may not be able to breathe correctly and can die. So before putting your baby in the crib to sleep, you should ensure that there should not be anything on his bed that can be grabbed by him. 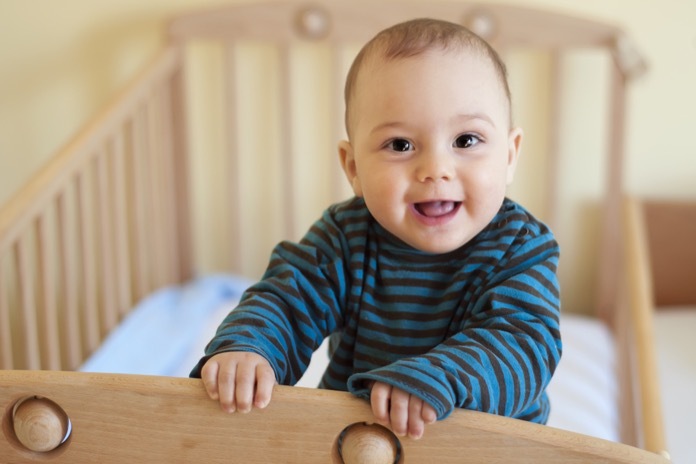 Thus by putting in and avoiding to put in certain things in the baby crib, discussed in this write-up, you can provide your baby the most comfortable and safest place to sleep in.